It’s quite hard to find anywhere in central Vienna that doesn’t have something worth pointing at while going “Ooooh”. Find photos, reviews, descriptions, insider tips and links in the articles below. There’s a lot to see in Vienna, and here are some other popular places to grab a sight to savour, perhaps a holiday snap or two, and even a snack to stave off sightseeing fatigue. The city is hugely popular with visitors during late November and December. Discover seasonal events and attractions, explore Christmas customs, get visitor tips and shopping suggestions, and more in the Christmas in Vienna section. For example, enjoy an insider view of the Christkindlmarkt and other main Christmas markets, or discover which one is best for your needs. Then get handy tips on how to make the most of your market visit. And once you’ve finished your Christmas punch, you can take a look at the city’s Christmas lights. Vienna fills up at the end of December, too. Get an overview of all the fun, games, events and more at the New Year in Vienna section. For example, discover the Silvesterpfad trail used by revellers on New Year’s Eve, and then enjoy the New Year markets the next day (or before). 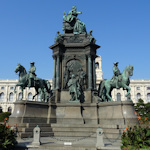 And no surprise to discover that the city attracts plenty of interest around Easter, which is why I have an Easter in Vienna section for you. For example (and equally unsurprisingly), there are several Easter markets.